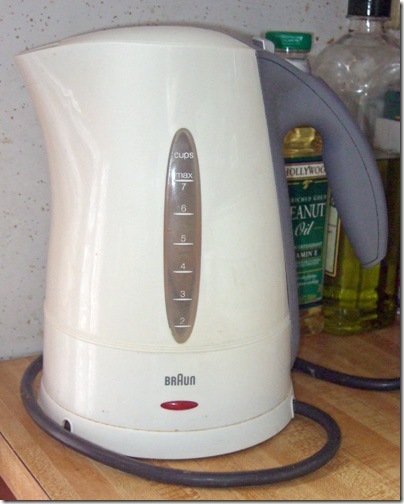 This electric kettle provided service faithfully since it was gifted to me for my birthday in 2004 by my Beloved Wife. It has produced boiling water for thousands of cups of tea, which has become an important part of our days’ rhythm. We are now trying to identify a worthy successor. But this Braun Tea Kettle will always have a special place in our hearts. This entry was posted in Life and tagged Family, In the kitchen on January 11, 2009 by Geoff.